You ever hear that saying, "You can be the ripest, juiciest peach in the world, but there's still somebody who hates peaches"? I hope I never come across that person who hates peaches, especially the ripe, juicy ones, because I don't need that kind of negativity in my life. Peaches in the summertime are like little kisses from Mother Nature. Last summer I tried a Blueberry Soup recipe from Golden Blossom Honey that was so good, I decided that I'd try their Chilled Peach Soup this year. And, just like last year's fruity soup recipe, I was not disappointed. My only issue is trying to figure out which recipe I like more. Chilled Peach Soup is perfect for morning breakfast, a light lunch, or as a refreshing snack. I'll have it out on my deck while I'm bird watching, or if I'm in a hurry, I'll pour it into a tumbler and sip it on the go. You know, what I'd add into that soup - a bit of mango! Mango would be a lovely addition! They haven't been on sale here lately, so I haven't been eating much of them though. I love adding fruits to my tea. I especially love blueberry and raspberry right now. However, I just had me some strawberry tea, and I think that's going to be my new favorite for the time being. Strawberries are nom in the tea too, mashed! Have you ever tried a mix of strawberries and banana? They also go superb with apricots :) I actually have a shower gel from Palmolive with that mix :) it's delightful. That's the most creative peach recipe I've ever seen. I can't wait to make this for weekend breakfast. Can soup be that easy!! 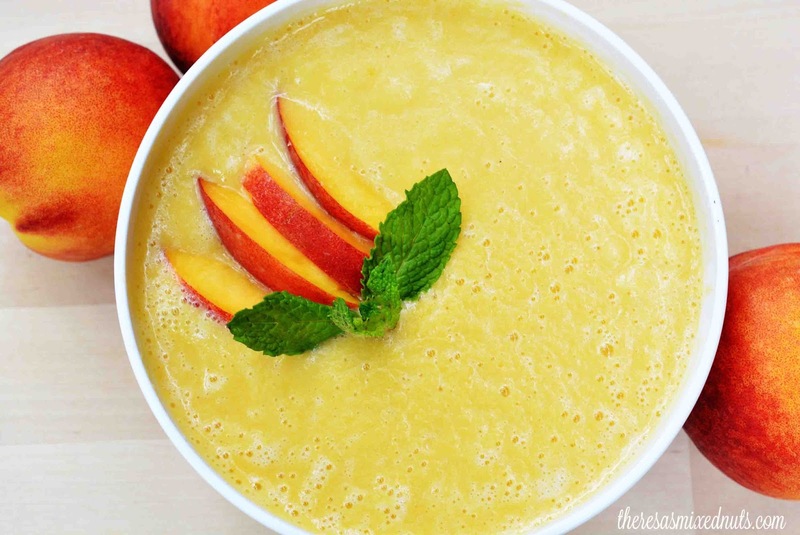 This sounds like a perfect summer soup! This sounds like the perfect summer dish. I love eating cold food in the summer because it is so refreshing. This looks like it would make a great breakfast. My favorite summertime fruit is watermelon. We have been dealing with sweltering heat here in Las Vegas, so it's too hot for traditional soup. This sounds like quite the sweet summer substitute! 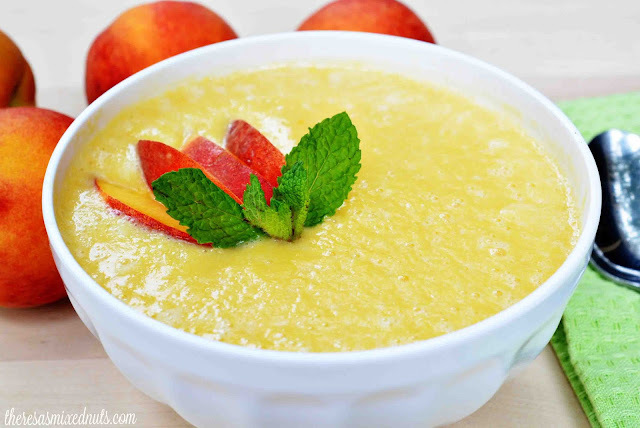 I have never heard of grilled peach soup before ... the photos remind me of oatmeal though, with less texture maybe. Oh wow this is a great recipe idea to try! Oh, I'd love to try this. I've never had a treat like this! It sounds like such a comforting snack. Looks and sounds interesting and yummy!! Wow, I love peaches! They are one of my favorite fruits, I will try this! I love chilled peach soup. Such a celebration of summer. What a brilliant way to serve the flavors of the season. I've never had a soup like this, but it sounds divine. This sounds good! I've never had anything similar to this before. I want to try it now. I've never had chilled soup before but I would definitely give it a try. I love fruit. Peaches just happens to be one of my favorite fruits. It looks so easy to do! I'd love to try this and the blueberry version. I have had chilled soup before, but never a fruit version. I can't even count the number of ways I love this one!! I have never had chilled soup before. This sounds so tasty and refreshing for the hot weather. Sounds like an easy meal, I will tell this to my wife. Anything peach. I am definitely going to try this recipe!